Today's ride was to be the biggest of the month so far. A ride to Heathfield and back up the Cuckoo Trail. The forecast was sunshine but the wind was 19mph south easterly. Fine for the way there but not so for the way back. We started just after 8am and stayed on the road until we got to the Cuckoo Trail. People traffic was low all the way until we got to Hailsham. We stopped at Subway for breakfast. We then proceed up the Cuckoo Trail again. We saw a number of cyclists, runners and dog walkers. The trail is tarmac or dense gravel along the whole route but there is a thin covering of mud in places at this time of year. It was getting stuck under my front mudguard at times. When we arrived in Heathfield I decided it was best for us to ride back via the road. I knew a route that should be low traffic and it's downhill so would be quick. I've never ridden out of the Cuckoo Trail before. It ends in Heathfield and I've only ever turned around and headed back the way I came. There's a short hill up to the High Street and then it's flat. Whilst riding along the High Street I spotted Olympic gold medallist Jane Torvill. Our route now headed south towards Horam and it was a fast downhill, not needing to pedal for most of it. We arrived in Horam and stopped at Wesson's Cafe to top up our water bottles and rinse the mud out of my front brake. We were back on the road to Hellingly and a few cyclists went past us. Our route then headed East to Magham Down and then south again to Rickney. The lane we headed down was muddy and potholed in places but nothing we couldn't handle. 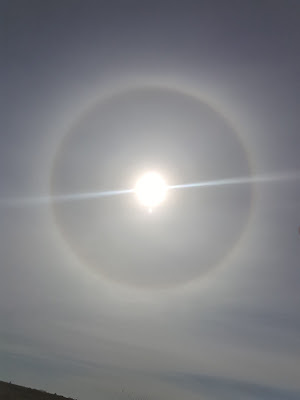 My son then pointed out that there was a rainbow around the sun. I looked up and noticed saw this halo around the sun. Never seen one for real so I took a photo. It wasn't long before we were back in our street and back home. We finished the ride with just over 31 miles. After 10 days my son has ridden 121 miles.